Introduction: For decades, we’ve accessed the research of the heroic John Loftus, author of (among other titles) America’s Nazi Secret. 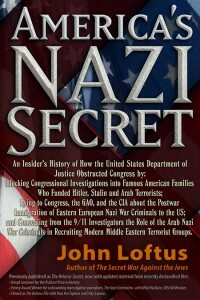 In this updated, supplemented version of his 1982 volume The Belarus Secret, John includes material that had been censored from the original book. Much of John’s work highlights malfeasance on a vast scale, centered in the United States on Justice and State Department elements. Those elements, in turn, were executing the political and economic will of the Robber Barons–monopolistic industrialists and financiers whose collective efforts manifest ted as the Gilded Age in the late nineteenth and early twentieth centuries. Curbed by the Theodore Roosevelt’s Anti-Trust Act, the “Malefactors of Great Wealth” (as TR called them) secured the passing of the Webb-Pomerene act, a loophole that precipitated much of the disastrous history of the twentieth century. Seeking to dominate the global economy, the “Malefactors” sought to fuse the totalitarian states of Nazi Germany, the U.S.S.R. and Saudi Arabia, dominating the fossil fuels industry and creating indissoluble industrial cartels. Far from being brought to justice for their active treason against the United States, the Robber Barons and their enablers successfully hid their wrongdoing. Program Highlights Include: The use of what was to become Auschwitz to use Silesian coal, German patent technology and slave labor and Soviet rail links to produce aviation fuel; the Nazis’ use of American corporate executives in Germany during the war; Frank Wisner’s secret government-within-a government–the OPC; the genesis of the Green Berets–growing out of Frank Wisner’s OPC; the role of Allen Dulles in the founding of Saudi Arabia; the history of the Muslim Brotherhood; the links between the U.S. industrial and financial elite and those of the Axis powers of World War II; the Bush family’s profound links to Nazi finance and industry; the Vatican’s pivotal involvement with the Axis powers and postwar international fascism; John’s use of a phone-card sting to help uncover the Muslim Brotherhood operations in the U.S.; John’s lawsuit against Sami al-Arian, that led to the Operation Green Quest raids of 3/20/2002; the Crusade for Freedom and the genesis of the Nazi/GOP connection; Henry Kissinger’s role in forging the postwar Nazi “freedom fighter” networks run by Frank Wisner and the OPC. 1. The genesis of the events and processes analyzed by John Loftus in his book could be said to originate with the Webb-Pomerene act of 1918.
. . . . Teddy Roosevelt, arguably the most honest of the Republican Presidents, was the only one in the GOP who tried to bring the Robber Barons to their knees. He persuaded Congress to pass extremely strict anti-trust, anti-cartel, and anti-monopoly legislation. In 1918, the Robber Barons fought back, and somehow convinced Congress to pass the Webb-Pomerene Act. This little-known loophole permitted the creation of American trusts, monopolies, etc., as long as it was done overseas. Because of this loophole law, investment capital left America in a great flood, one of the contributing causes of the crash of 1929 and the Great Depression. . . .
2. The Justice Department played a role in the actual drafting of Webb-Pomerene. . . . . It was the Justice Department itself which helped draft the Webb-Pomerene Act of 1918 to carve loopholes in Teddy Roosevelt’s “trust busting” legislation. This enabled the Robber Barons to establish trusts, cartels and monopolies overseas, draining America of investment capital, and helped to bring about the crash of 1929. . . .
3. Over the years, For The Record has featured much discussion of the U.S./Nazi industrial connection–much of it in past discussion with John and/or use of his investigative masterpieces. Exemplifying the depth of this connection is Third Reich’s employment of U.S. corporate executives in Germany during the war, aiding the Nazi war effort! Briefly interned after the war, they were ultimately set free.
. . . During the Nuremberg trials, one of the prosecuting attorneys, the same Walter J. Rockler who later became my boss at OSI, discovered a German document listing the thirteen American banks that had secretly worked for the Third Reich during WWII. After his investigative unit was shut down, Rockler kept the Nazi bank list to prevent it from being shredded. . . .
4. More on these “resident collaborators”–who were briefly interned.
. . . The German bankers that Rockler was trying to prosecute at Nuremberg had hired American and British corporate executives—who had then become the secret residents of Camp Ashcan/Dustbin. It was the Special Assistant Attorney General Victor Swearingen who had kept all the American and British moneymen hidden from the nosey Nuremberg prosecutors. Political smear tactics forced Rockler out before I could tell him why all Nazi financial crimes investigations kept getting closed down. He was getting much too close to the truth. The money that funded the banks and corporations of the Third Reich came from Wall Street and “the City,” London, England’s financial district and Wall Street equivalent. President Roosevelt knew about it, and so did his Secretary of the Treasury, Henry Morgenthau. . . .
5. Some of the corporate criminals who were [temporarily] interned at Ashcan/Dustbin were quite confident of their acquittal, due to the influence of their corporate associates.
. . . He was the Justice Department lawyer who let free all of the American corporate executives who had stayed in Germany to help their Nazi clients. These businessmen had literally given aid and comfort to the enemy during the war. All the striped suit traitors were held in a joint prison camp code named Ashcan/Dustbin. The prison camp was under British authority, but the guards were all Americans. One of the guards told me years later that one of the pompous prisoners boasted that his friends at the Chase Manhattan Bank would take care of him. “Are you sure they would even want to hear your name?” the guard asked, confident that no American business would ever help someone accused of treason. The prisoner was right. The guard was wrong. The Special Assistant Attorney General of the United States closed all of the treason cases in Occupied Germany. Not a single corporate officer ever went to jail for doing business with the Nazis, either in America or the United Kingdom. The Justice Department covered it all up. More than a hundred American traitors were returned home after many profitable years of serving Hitler. The Army’s original investigative files, codenamed ASHCAN and DUSTBIN are still off limits to “protect the privacy” of the American citizens involved. . .
6. Henry Kissinger’s political genesis is to be found at the nexus of the U.S./Nazi postwar collusion. . . .Kissinger was recruited as a professional spy for Dulles shortly after the end of the war in Europe. Although there is no evidence that he personally recruited Nazis, Kissinger ran the intelligence file room where records of Nazi recruitment were kept. He then transferred to Harvard where he specialized in recruiting foreign students for espionage. Later he worked for Dulles during the glory days of Office of Policy Coordination (OPC). He was hired as a consultant for a private group known as Operations Research Office, which planned to use former Nazis as agents behind Russian lines in the event of World War III. Mention of Kissinger’s classified work was censored from the original manuscript of this book. . .
7. In addition to Kissinger’s work at Harvard on the Nazi “freedom fighter” program, the Nazification of U.S. academic ideology during the Cold War is exemplified by an amusing episode in John’s book–his raid on the offices of Alexander Dallin–the chair of the history department at Stanford University. While working for the OSI division of the Justice Department, John learned that some of the missing documentation on the importation of Nazi war criminals had been purloined by Dallin!
. . . I found some of the missing documents when I raided the offices of Professor Alexander Dallin, Chair of the History Department at Stanford University. The terrified professor quickly turned over boxes of unpublished Einsatzgruppen reports, records of the SS mobile killing units in Eastern Europe. These records contained the names of Nazi collaborators from Belarus and Ukraine, men who had earned their spurs by carrying out the mass murder of their own countrymen. Similar records concerning Polish collaborators with the Nazis were pulled from the Nuremberg trials before the Russians could get their hands on them. The most distressing stolen document that Professor Dallin produced from his hoard was the unpublished memoirs of a senior SS officer, Friedrich Buchardt, who had written a history of the Nazi occupation of Eastern Europe. Professor Dallin had plagiarized Buchardt’s manuscript for his own famous work, Russia Under German Rule. Buchardt had been the leader of VorKommando Moskau, one of the SS mobile killing units which specialized in recruiting local collaborators from Belarus and the Ukraine as spies. . . Among the war criminals that Wisner put to work for OPC was Dr. Franz Alfred Six, sprung from the defendant’s dock at Nuremberg. His sentence commuted by U.S. High Commissioner for Germany (and Chase Manhattan Bank chairman) John J. McCloy.
. . . Six, however, was at that moment on trial at Nuremberg for his war crimes. Wisner asked General Clay to intercede with the Nuremberg prosecutor and judges. Whether Clay took such action is unknown, but Six received only a twenty-year prison term, while the rest of the Einsatzgruppen commanders were sentenced to death. In 1950, Clay’s successor, John J. McCloy commuted the sentence to time served. . . .
9. Wisner and Dulles’ “Freedom Fighters” program evolved into the Green Berets.
. . . With the disbanding of the few remaining cadres of Wisner’s secret army, the Special Forces were taken over by the Army and became the nucleus of the Green Berets. . .
10. After reviewing the origins and nature of the Muslim Brotherhood, John related a fascinating gambit in which he and private investigator Bill Warner were able to “make” many of the Muslim Brotherhood terrorists in the United States. Originating in the investigation of Sami Al-Arian, the stratagem entailed buying phone cards for use by the terrorists. . . . . With [Professor Sami] Al Arian’s support, and financial help from the Saudis, Al Arian’s clan purchased a series of auto dealerships in western Florida. One of them was on land owned by Al Arian. Stolen luxury cars across the USA were funneled through the clan’s network to Dubai, where they were re-sold for two or three times their price by a car network run by one of Al Qaeda’s “golden chain” financiers. Older vehicles were turned into car bombs to kill American soldiers in Iraq. Two of the car bombs have been traced through the Clan’s network through their vehicle identification (VIN) numbers. A brilliant private investigator named Bill Warner of Sarasota, Florida, came up with an extremely innovative method of tracking the members of the Clan’s terrorist network. He approached me for a list of all Al Arian’s friends and clan contacts. Warner then sent out an advertisement to each of them enclosing a pre-paid cell phone card. The pitch was to try our new phone company’s international call service free for ninety days, and then decide whether to become a permanent subscriber. One of the idiots in the clan actually used our calling card. In one stroke, we had become the Muslim Brotherhood’s telephone service. As a telephone company, we lawfully purchased the phone bills of everyone our customer contacted, allegedly to recruit new customers. We used the phone bills to identify the clan’s overseas contacts, and then I cross-matched the phone records against the terrorist attacks of Hamas, PIJ, and Al Qaeda, all of which are subsidiaries of the Muslim Brotherhood. The results were astonishing. We had the calling records of the Al Qaeda cell in Ceuta as they planned their abortive attack on shipping off Gibraltar. We could tell that every time a clan member in California called a cell phone in a refugee camp in Jordan, a terrorist attack on Israel would take place that same day. Mr. Warner and I assembled a nationwide map of terrorist logistical cells in America complete with their overseas telephone contacts. We did not trust the Justice Department’s FBI, so we presented our cell phone map to NORTHCOM military intelligence. Despite our regrets, NORTHCOM had to ask the FBI for court authorized search warrants top lace taps on the phones and computer terminals of these terrorists’ supporters. The FBI typically rewrote the warrants as if they had done the investigation. Neither Bill Warner nor I ever received a penny of the promised million dollar reward money. As we feared, someone in the FBI tipped off the terrorists. They all stopped using the cell phones and calling cards we had been tracing they all went silence at once. Worse, the FBI closed all investigations by other government agencies into the Florida clan just as they had closed Operation Green Quest, the Immigration Service’s attempt to trace terrorist funding of Al Arian from the Saudis. The Saudis’ “International Institute for Islamic Research (IIIR)” is banned as a known funding source for terrorism worldwide, but like the Muslim Brotherhood, it enjoys a strange immunity from the United States Department of Justice. . . .
NORTHCOM ran all of our phone numbers through their terrorist data base. “It lit up like a Christmas tree!” The agent exclaimed. NORTHCOM knew that terrorists overseas were calling American phone numbers, but had no idea who they were contacting or why they were calling. Our little telephone company had provided U.S. intelligence with a nearly complete map of every terrorist cell in the USA and abroad that called the Muslim Brotherhood for help. 11. Indicative of the controversial nature of the material discussed in John’s book is the fact that documentary filmmaker Clair Ragge was raided by the IRS without explanation. Records and financial documents were confiscated.
. . . During the last four years, independent filmmaker Claire Ragge has done a thorough inquiry into the newly declassified files on the men who funded Hitler. Her film tentatively titled “American Secrets” should be ready for release in 2011, along with a website listing each historical document sourcing each of the film’s allegations. Ms. Ragge has done a remarkable job, and has uncovered many secrets that would otherwise have escaped public scrutiny. . . . However, there is some concern that the film may never see the light of day. The IRS has suddenly seized Ms. Ragge’s bank accounts without even a pretext of notice. I have seen this sort of thing happen before. I once helped the Canadian Broadcasting Corporation do a documentary on Slovakian Nazis living openly in Canada. There was some superb film footage of the Pope blessing a new Slovakian Cathedral while the camera panned over the Nazi war criminals sitting in the audience. No one in Canada eager saw that film because the CBC caved in under the threat of endless litigation from Steven Roman, a Slovakian nationalist who happened to be the richest man in Canada (and Richard Nixon’s partner in a Canadian-American uranium mining business.) . . .
12. Concluding with an anecdote about what John has endured, the program sets forth a frightening array of medical problems John has overcome, while waging his Good Fight against the Powers That Be. During the 1970’s and 1980’s, I had more than two dozen surgeries for broken facial bones and sinus damage from a parachute accident when I was an Army Officer. The VA missed a few things. In the 1990’s, I was also diagnosed by private physicians with colon cancer, prostate blockage, kidney stones, and shoulder damage, each of which required surgery. In 2010, the VA finally discovered that I had two displaced hips, several broken ribs, broken vertebrae and crushed disks, which they had somehow missed during the last four decades of treatment. The VA conceded that, more likely than not, these undiscovered injuries had been sustained in my Army parachute accident. There are third world countries that provide better medical care than America gives its disabled veterans. . . . I will never forget that John was in fact the LAST person to be able to read the file on the Muslim Brotherhood before it was sanitized…Wow! And not to mention his work on the Third Reich per se, of course! If we have just the slightiest chance to defeat fascism, we owe it to him for the most part. The last paragraph of the post gives the impression that John had much more misadventures than just a parachute accident…Am I right? I have ordered the book, by the way, and I am eager to begin reading. Hi, i wish that this books among other of the books mentioned by Mr. Emory on his WFMU shows were translated to the spanish, i find all this very interesting and important. How do we know that John Loftus is not just “limited hangout”? Throwing a few “bones” to the more serious researchers while basically maintaining the official story about 9-11? His thesis seems to be that “Islam-o-fascists” are really to blame for 9-11 and are just “blow-back” from all the nefarious dealings of U.S. Intelligence agencies over the years. Loftus seems to dismiss any possibility of active complicity by elements of U.S. Intelligence in 9-11. I think Mike that you have not read John Loftus at all. I suggest that you read him first and talk later. You will see that he says things far more complex and subtle than the gross reductions and caricatures that you are suggesting. He DOES say, by the way, that U.S. intelligence is involved. Do your homework, please. The readers of this website are learned, skilled and intelligent. This commentary doesn’t pass the test. Sorry. MINNEAPOLIS (AP) – At least 10 suspected Nazi war criminals ordered deported by the United States never left the country, according to an Associated Press review of Justice Department data – and four are living in the U.S. today. All remained eligible for public benefits such as Social Security until they exhausted appeals, and in one case even beyond. That’s currently the case of Vladas Zajanckauskas in Sutton, Massachusetts. It’s the case of Theodor Szehinskyj in West Chester, Pennsylvania. Of Jakiw Palij in New York City. And of John Kalymon in Troy, Michigan. The United States can deport people over evidence of involvement in Nazi war crimes, but cannot put such people on trial because the alleged crimes did not take place on American soil. The responsibility to prosecute would lie with the countries where the crimes were committed or ordered – if the suspects ever end up there. In the 34 years since the Justice Department created an office to find and deport Nazi suspects, the agency has initiated legal proceedings against 137 people. Less than half – at least 66 – have been removed by deportation, extradition or voluntary departure. —a German rocket scientist accused of using slave labor to build the V-2 rocket that pummeled London. He later won NASA’s highest honor for helping to put a man on the moon. The Romanian-born Bartesch, who had immigrated to the U.S. in 1955, was suddenly stateless — and Austria’s problem. The fallout forced U.S. Attorney General Edwin Meese to apologize to the Austrian interior minister and assure him Austria would not be blindsided again. His gravestone — including a photograph of himself wearing a suit and tie — is already in place in Cepin’s Catholic Cemetery about 10 kilometers (6 miles) from his apartment.